70G450 screw-on (unlined) lid. Fits our standard Mason, Mayo and Jelly jars with 2 3/4" dia. Threads (70G450 threads), and many other brands Standard Mason size jars. Does not fit Wide Mouth. Click photo to see it on jars. Our Pulp Liner for Daisy Cut Lids works with this lid. Made in USA. 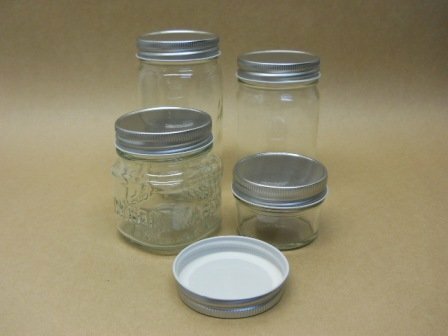 Fits Standard size Mason, Mayo and Jelly jars with 2 3/4" dia. threads (70G450 threads), and many other brands Standard Mason size jars. Does not fit Wide Mouth. Click photo to see it on jars. Made in USA. NOTE: This lid is gloss black enamel and shows every little scuff or finish flaw just like a black car. These lids come to us from the manufacturer bulk packed in a single bagged box of 1,000, without separators, so they touch each other during shipping, which creates slight finish flaws. If you are extremely concerned about their appearance you should order about 20% more than needed. We throw out the worst of the worst of the Black Enamel Lids but we don't really cherry pick the best to keep your cost down. Please view our Policies and Shipping pages prior to ordering. 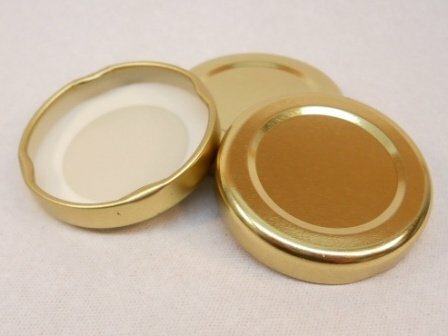 One piece gold lid with Plastisol Bead for canning. 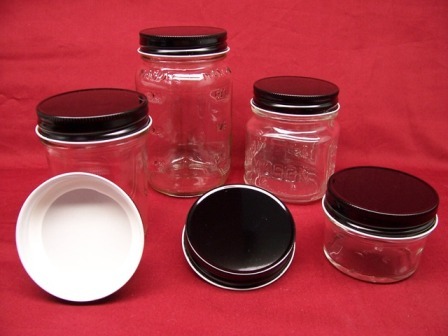 Fits Standard sized Mason, Mayo and Jelly jars with 2 3/4" dia. threads (70G450 threads), and many other brands Standard Mason size jars. Does not fit Wide Mouth. Made in USA. 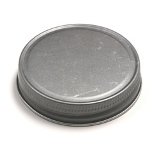 One piece silver lid with Plastisol Bead for canning. 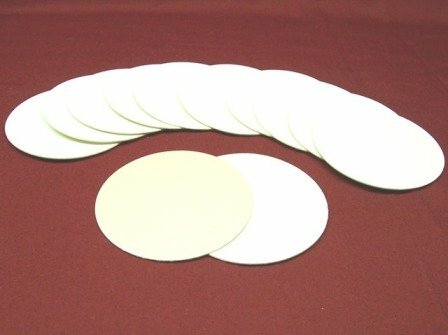 Fits our standard Mason, Mayo and Jelly jars with 2 3/4" dia. threads (with 70G450 threads), and many other brands Standard Mason size jars. Does not fit Wide Mouth. Click photo to see it on jars. Made in USA. This heavy decorative unlined lid fits our 8 oz Mason and our 12 or 16 oz Mayo Jars as well as Ball, Kerr, Atlas and other Brands with Standard 70G450 2 3/4" diameter threads (AKA Small Mouth) for that primitive/rustic old look. While the manufacturer states it is food safe, it's intended use is as a decorative candle jar lid only. Not for canning; there is no seal and our Pulp liner does not fit this lid. 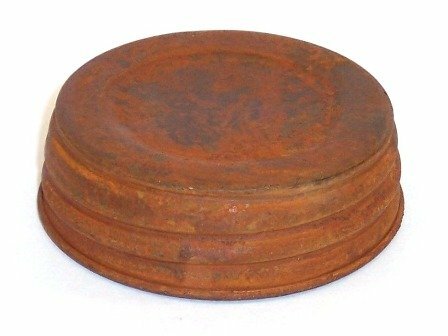 The primitive nature of these lids, and the fact they are made in China, means the finish can be smooth or rough and the threads are loose and can pop off when over tightened. 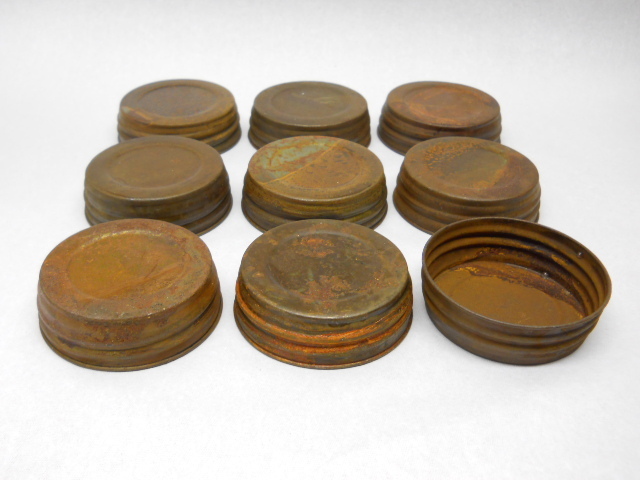 The rust finish can vary and the tops can vary from indented, flat or domed from lid to lid, and batch to batch, even a mix within the same order. 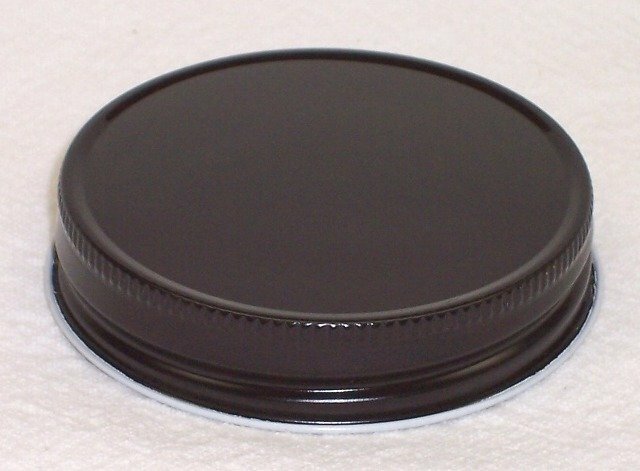 This heavy decorative unlined lid fits our 8 oz Mason and our 12 or 16 oz Mayo Jars as well as Ball, Kerr, Atlas and other Brands with Standard 70G450 2 3/4" diameter threads (AKA Small Mouth) for that primitive/rustic old look. While the manufacturer states it is food safe, it's intended use is as a decorative candle jar lid only. Not for canning; there is no seal and our Pulp liner does not fit this lid. 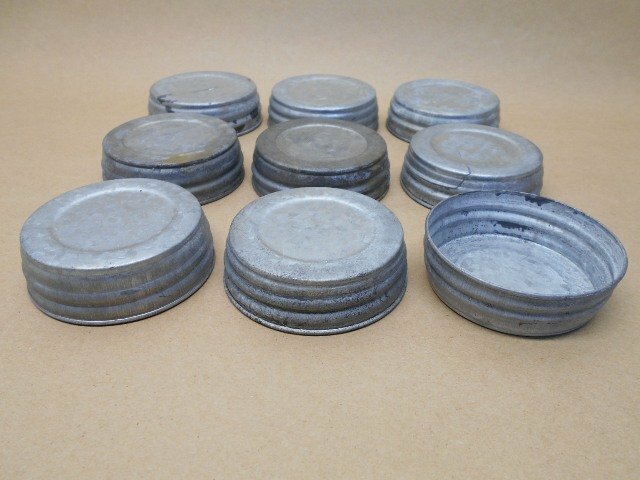 The primitive nature of these lids, and the fact they are made in China, means the finish can be smooth or rough and the threads are loose and can pop off when over tightened. The zinc finish can vary from shiny to dull/gray with dark or rust spots. The tops can vary from indented, flat or domed from lid to lid and batch to batch even a mix within the same order. 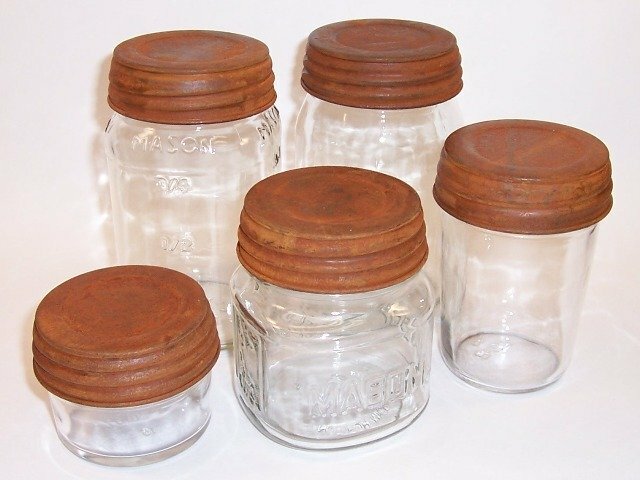 Decorative Lid Fits Ball, Kerr, Atlas and other Brands Wide Mouth jars with 3 3/8" diameter threads for that primitive/rustic old look. 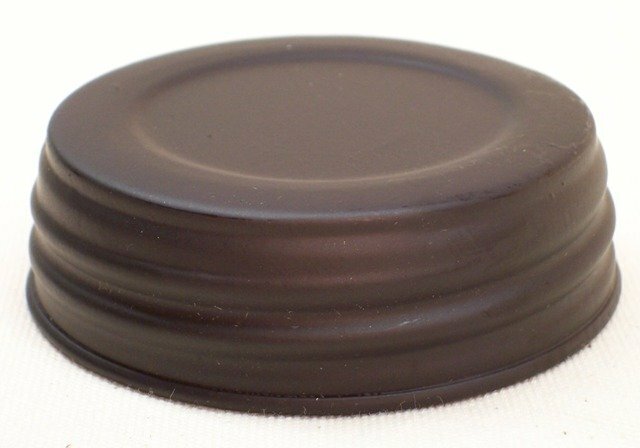 While the manufacturer states it is food safe, it's intended use is as a decorative candle jar lid only. Not for canning; there is no seal and our Pulp liner does not fit this lid. 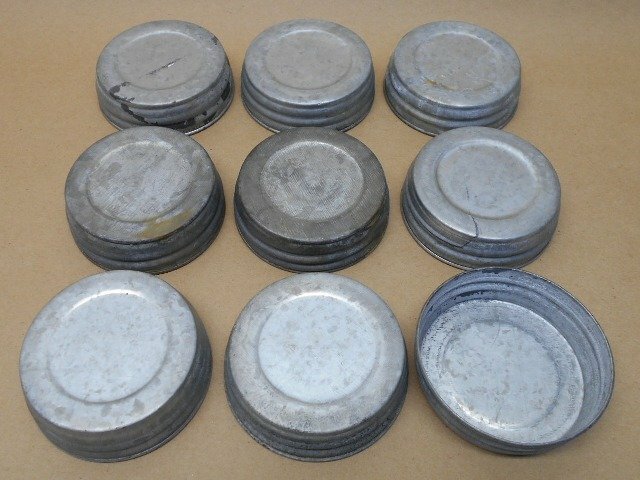 The primitive nature of these lids, and the fact they are made in China, means the finish can be smooth or rough and the threads are loose and can pop off when over tightened. The black finish can vary and the tops can vary from indented, flat or domed from lid to lid and batch to batch even a mix within the same order. The photo may not be completely representative of the lids you will receive. Remember �Primitive�! Made in China. 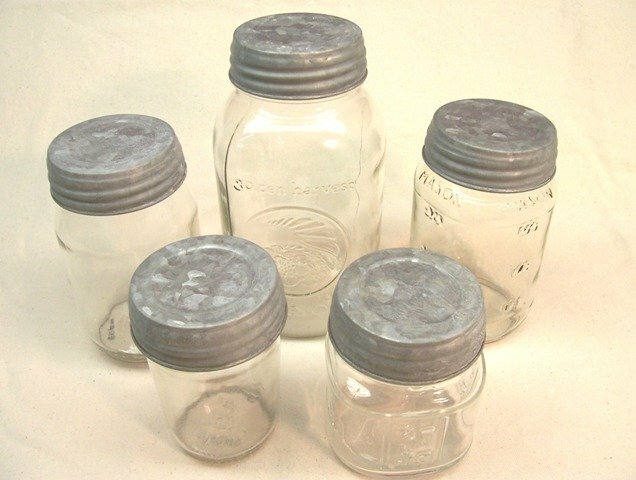 Decorative Lid Fits Ball, Kerr, Atlas and other Brands Wide Mouth jars with 3 3/8" diameter threads for that primitive/rustic old look. While the manufacturer states it is food safe, it's intended use is as a decorative candle jar lid only. Not for canning; there is no seal and our Pulp liner does not fit this lid. 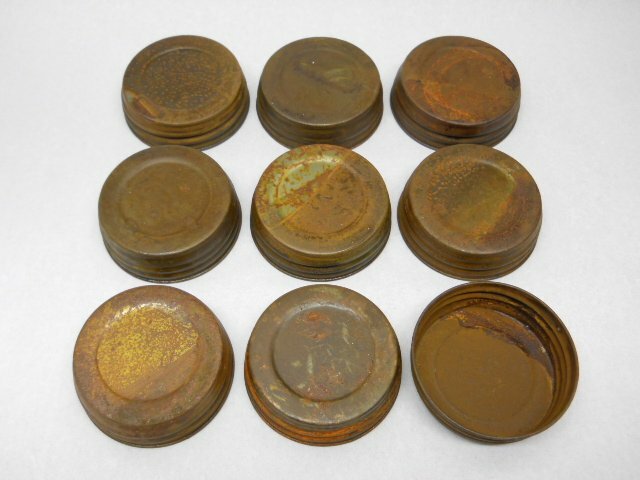 The primitive nature of these lids, and the fact they are made in China, means the finish can be smooth or rough, shiny or dull, and the threads are loose and can pop off when over tightened. 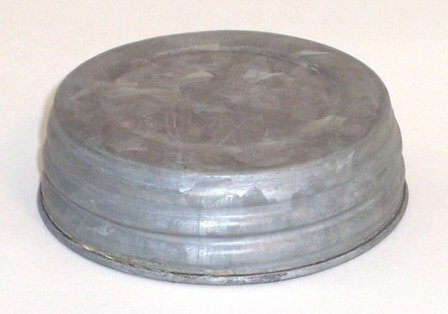 The rust finish can vary and the tops can vary from indented, flat or domed from lid to lid and batch to batch even a mix within the same order. Decorative Lid Fits Ball, Kerr, Atlas and other Brands Wide Mouth jars with 3 3/8" diameter threads for that primitive/rustic old look. While the manufacturer states it is food safe, it's intended use is as a decorative candle jar lid only. Not for canning; there is no seal and our Pulp liner does not fit this lid. The primitive nature of these lids, and the fact they are made in China, means the finish can be smooth or rough and the threads are loose and can pop off when over tightened. The zinc finish can vary from shiny to dull/gray with dark spots. The tops can vary from indented, flat or domed from lid to lid and batch to batch even a mix within the same order. These tiny one piece twist (tw) lug lids fit small glass jars like our 1.25oz Mini Jam jar with twist threads and they have the plastisol bead for a good seal when canning. They do NOT fit any jar with continuous thread (CT). Lid tops will vary somewhat. These one piece twist (tw) lug lids fit glass jars with twist threads and they have the plastisol bead for a good seal when canning. 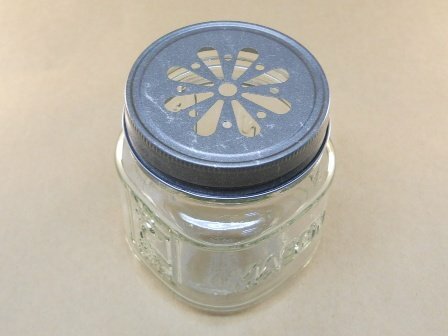 They do NOT fit Standard or Wide Mouth continuous thread (CT) Mason Jars with screw on threads. About 175 left at last update. If we have less than you order we will send you what we have left. Clearance Items are not returnable for any reason. Please visit our POLICIES page for more info.